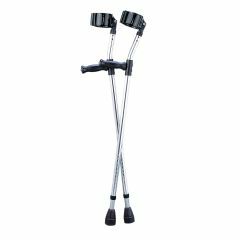 Guardian® Forearm Crutches provide stability as well as independence for those requiring assistance in ambulation on a long-term basis. Made of lightweight aluminum with sizes to fit youth through tall adult. Tall Adult: 5'10" - 6'6"
Warranty Information: Guardian® products have a limited lifetime warranty against defects in materials and workmanship with the exception of the folding cane, walker footpieces and hand-held shower kit, which are warranted for one year. This warranty does not extend to non-durable components, such as but not limited to, rubber accessories and grips which are subject to normal wear and tear and replacement. In the event of a defect covered by this warranty, we will at our option repair or replace the product. Supports Weight. Stores Easily. Well Constructed. Lightweight. Safe. Lasts longer than others. Easy To Use. Outdoors. Short Distances. Indoors. Long Distances. Stores Easily. Easy To Use. Lightweight. I am a lifetime user of forearm crutches. I used to love Guardians until they replaced the metal cuff tube with plastic. The first pair I got with this quailty downgrade broke within a few months causing me to fall. I missed hitting my head on the fireplace by only a few inches. To use plastic in this stress point is dangerous. I would rather pay a few dollars more and be safe. If you use them be aware of this danger. I wrote the manufacturer about my concern but they never replied. Inferior design - cheap imitation of the orginal crutch. Cuff diameter too large, no taper, opening too wide. No bushings under lock nuts. No longer made in the USA - just another questional item made in CHINA. Bigger profit for Sunrise at the user's expense. Well Constructed. Comfortable. Supports Weight. Easy To Use. Grips are slick. Tips wear down easy. Indoors. Long Distances. Reduce Stress. Relieve Tense Muscles. Everyday. Long Term User. Teenager. Balance issues. Supports Weight. Safe. Well Constructed. Comfortable. I purchased 05161 crutches from you. they need repairing badly. SINCE i PURCHASED these from Allegro I would like to return them to you for repair. They have a life time warranty. Just curious here, I have used the exact crutch now for over 5 years..And I am not gentle with them by any means, just actually replaced the original tips a few days ago...What exactly is your specific failure?